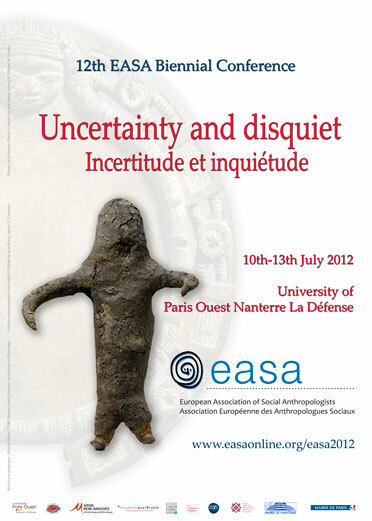 The 12th biennial conference was hosted by Laboratoire d'ethnologie et de sociologie comparative (LESC) at the University of Paris Ouest Nanterre La Défense. Over 1400 academics discussed work based around the theme. The keynote address was given by Professor Caroline Humphrey of the University of Cambridge. With three plenaries, over 140 workshops, a film programme, and and the usual additional attractions this was a busy conference..
To download a certificate of attendance, use the login link up top; once within Cocoa, find the line referring to your registration and click on the 'C' icon at the end to download and print off a signed PDF. The keynote and plenaries remain available to all, via webcast. Dionigi Albera, Director of IDEMEC; Baptiste Buob, LESC; Carine Constant, MAE; Sophie Chevalier, IIAC; Myriam Danon, MAE; Jean-Luc Guinot, Université of Paris Ouest Nanterre La Défense; Monica Heintz, Université Paris Ouest Nanterre La Défense; Christine Jungen, IIAC; Dimitri Karadimas, Deputy Directeur LAS; Anna Laban, Administrator of Dept for Research, MQB; Isabelle Rivoal, LESC; Anne de Sales, LESC; Gabrielle Stobeo-Greze, MAE; Gilles Tarabout, Directeur LESC. Maria Couroucli, Jeanette Edwards, Abdullahi El-Tom, Thomas Fillitz, Mark Maguire, Susana Narotzky, Noel Salazar, David Shankland, Baptiste Buob, Sophie Chevalier, Monica Heintz, Christine Jungen, Dimitri Karadimas, Anna Laban, Gilles de Rapper, Isabelle Rivoal, Anne de Sales, Gilles Tarabout.